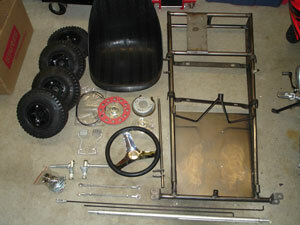 The following is a "how to" guide for building an Azusa Fun Kart. We chose an Azusa kart for a few reasons. First, Azusa Engineering has been in business for a very long time proving they provide quality and customer satisfaction. Secondly, Azusa has every part needed to build a complete rolling kart down to the last nut and bolt. Lastly, Azusa has the most affordable go kart parts available. This makes the Azusa Fun Kart the perfect choice for a parent/child project that will build wonderful memories that will last forever! The Azusa Fun Kart is a simple to build go kart that only requires basic hand tools to build. No welding is necessary to put this kart together. We used a Honda GX200 clone engine purchased from www.affordablegokarts.com. Our kart reaches a top speed of 30mph, however, the top speed is easily adjusted faster or slower with a simple gear change. The Azusa kart is the perfect size for children ages 6 to 10. You will see we added an extended bumper to our kart so older kids and adults can drive too. You need parts before you can do anything. Azusa sells this kart as a complete kart or the parts can be purchased individually if there are certain parts you want upgraded. Azusa does not sell to the public so you can contact them at (626) 967-4167 to find your nearest dealer. You can also find great deals for Azusa parts on eBay. This kart is sold as a complete kit with nylon wheels as part number 3557. The kit is also available with aluminum wheels as part number 3551. Here is a list of part numbers for all of the parts needed to build a complete Azusa Fun Kart. You will need to add an engine and clutch to the list which is not sold by Azusa. Here are the Azusa part you will start with. The Azusa sprocket is not red like the one pictured. We had an extra sprocket we decided to use. You will also need to add an engine and clutch to this group of parts. For great prices on engines, check out www.affordablegokarts.com. 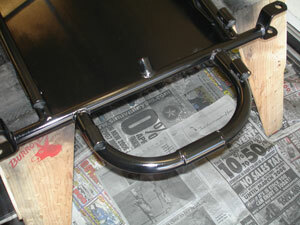 The first thing you will need to do is paint the frame and steering shaft hoop. 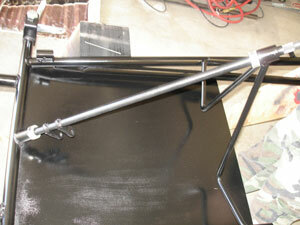 We cleaned up the frame with steel wool and then sprayed on a couple coats of primer. The kids chose black for the color and under my supervision, they had their first painting experience. Allow the paint to dry overnight before attempting to put the kart together. We added a front bumper to our Azusa Fun Kart so we could mount an extra set of pedals for the taller drivers. We had to bend some tubing and weld it to the frame in order to accomplish this. In the end, the extended pedals worked out great. 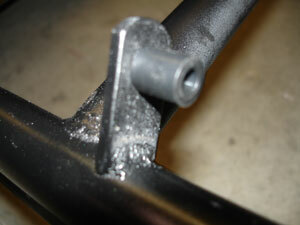 We also welded this tab to the frame in order to use and extra band brake we had. Since we already had a brake, we did not use the 6" Internal Expanding Brake which comes as part of the go kart kit. We will discuss both brake setups a little later. We will start at the front of the kart and install the spindles. The spindles come with four split nyliner bushings (two for each spindle). Install these bushings into the spindles. Place each spindle into the "C" shaped spindle brackets. 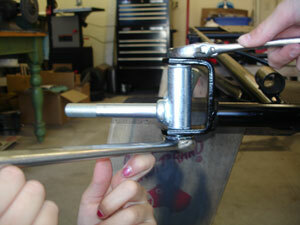 When properly installed, the spindle arms will point up and to the rear of the kart. The bolts that hold the spindles in place are called the king pin bolts. Insert the king pin from the top and secure with a lock nut. Tighten the lock nut then back it off just enough to allow the spindle to swing freely inside the bracket. Now install the steering shaft hoop. 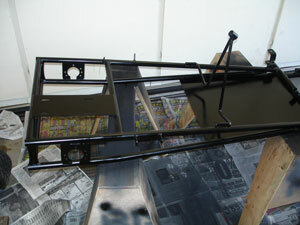 The hoop slips into two pieces of tubing that are welded on the top frame rails of the kart. Slide the hoop in from the front of the kart. Now you can install the steering shaft. Slide a locking collar onto the spline end of the shaft. 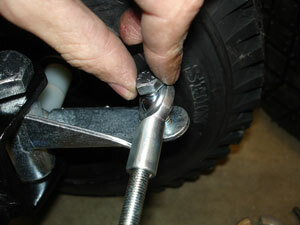 Insert the spline end into the steering hoop. Now put a locking collar onto the bottom of the steering shaft and insert the shaft into the steering support tube which is welded onto the kart frame. Slide the locking collars in opposite directions from each other and tighten the set screws to keep the steering shaft from moving up or down. Screw the rod ends to the end of the tie rods. Bolt each tie rod to the end of each spindle by placing the bolt through the top of the tie rod and spindle and securing with a lock nut.